With a website the size of ours, and the number of people contributing to it, there’s so much content being created and so much information available – but is anyone finding it? We want to promote Clearing across the whole website, so you’ll see banners in various places like the external homepage, Study, Undergraduate, and our Faculty pages. If you think your area of the website should have one, please get in touch! 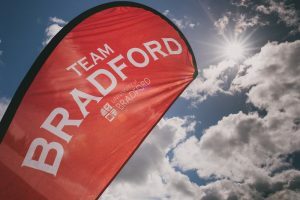 There is so much going on in Bradford, but we’re a shy lot and we don’t always shout about it. Every month I’m seeking out some of the most exciting events and venues so students – and potential students – can branch out beyond the (excellent) Friday Night Disco. Check out August’s highlights, ask for the What’s On banner to be added to your area of the website, and tell me about events you think are worth a mention – get in touch on Twitter. September is going to be an exciting month at the University of Bradford, as we’re hosts of both events. The Web Team created the website for the Fringe festival (in record time!). You can also check out the British Science Festival website. We love Storify. It’s a really simple and fun way to tell a story! Check out the Students’ Union Storify feed, and the University of Bradford’s one. You can easily embed a story into a website (check out the Graduation one), so if you’re interested in creating one – get in touch with the Communications team. Speaking of the Students’ Union, the ubuonline website has had a bit of a rejig recently, with sports and societies split up into separate sections to make it a bit easier to find out what you want to know. There’s lots of information on there about Freshers’ events, the new sabbatical officers, and upcoming trips. They’ve also made a video about some of their recent trips to Scarborough and Whitby! I think that’s more than enough to be getting on with for the moment! Spotted any great content around the University? Got any suggestions? Get in touch by email or on Twitter!